reachers, folding reachers, locking reacher and magnetic reacher. Scroll down to see our selection of Reachers for sale. Reachers See our selection of reachers to find the product that best fits your needs. Our Uplift Seat Assists come in several different lengths, styles and various options such as folding reachers, locking reachers, magnetic reachers, reacher grabbers and grippers for your every need..
What is a Reacher? Reachers may also be referred to a reacher grabbers, grippers or a variety of names, but are all basically used for the same purpose which is to assist the user to reach or grab objects that would either otherwise be difficult or impossible for them to get to. They may be used by someone who suffers from arthritis, lack or dexterity or grip strength, those who are wheelchair bound, or just simply to short to get to an item that is either to high or to low for them to reach. They may be used to help getting dressed, retrieving items in tight places, picking up items from your lawn or just simply to scratch that hard to reach spot on your back. 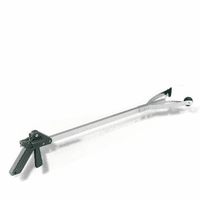 Reacher, EZ Assist Reacher - 32"
Reacher, Rubber Grip Reacher, 30"
Reacher, Rubber Grip Reacher, Locking Reacher, 30"